Announcement #1 My fab gal pal Rebecca (yeah, I know it is weird, same name) is going to be selling those wonderful crocheted flowers that are so popular right now through my blog. Not only will they be slightly cheaper than available elsewhere (Canadian dollar rates give you about a 15% discount) but she/we will be taking orders for colours and styles! No buying unknown colours in a pack like SOME stores! Almost any colour is available by using embroidery floss; you can request a specific colour by number if you wish. She is also going to make some special ripple-y petalled and double-layered ones! 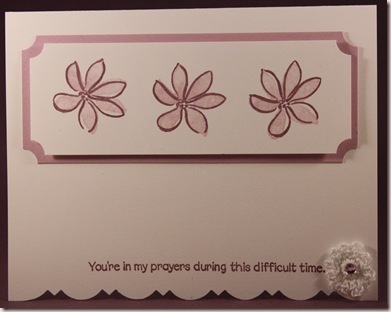 For example, a typical single-layered, 5-petal flower 1” will be $1. You can request slightly larger ones, about 1 1/4” for layering. Double layered with connected centers will be $2. I will be adding photos with prices soon! Announcement #2 I now have an Etsy store, link at the top of my sidebar! I know a lot of you reading this make your own cards and are here looking for inspiration and ideas but if you don’t make enough for friends or relatives, I’d love some referrals. Oh yeah, baby! It doesn’t get any easier and quicker than this! Easy Peasy Lemon Squeezey!! LOL! I was inspired by the CAS blog(Clean and Simple). Two colours of paper, two punches, two inks, two embellishments, three stamps and three adhesives. Ink: Perfect plum, pale plum-SU!